When I invite someone over to my home, hospitality is one of my main goals. I want my guest to feel completely at ease and at home, and not have any worries about anything – even about spilling something on the floor. If my guest is not at ease, then our conversation won’t be at ease, and we will miss out on the richness of a relationship that comes from the freedom to relax, be yourself, and fully engage with the other person. Over the years, as I have worked with people seeking to deepen their spiritual lives, I have noticed a theme: those who find it a struggle to go deeper into the divine or to move beyond their current place in their journey, are most often missing a hospitable space and a hospitable time. They are missing a space where they can feel at peace, calm, and freely open themselves to the divine, and a time when they can devote themselves fully to this relationship. I often encourage people to set aside time and a space to just “be” with God – where they do very little talking, but just sit and be with God. Be comfortable with the silence, and pay attention to what they hear. The most common comment I get in response is that it is just too hard – they can’t focus, they get antsy, other things/people call for their attention. Others will tell me that they spend a lot of time in prayer – they pray constantly, like a running conversation throughout the day, so they see no need to set aside time to pray and be with God – they are always praying and God is always with them. I think both are missing something vital – a sense of hospitality – both toward God, and toward themselves. What does it mean to be hospitable toward God? It means setting aside time when it is just for God – when we aren’t going to be interrupted by the clerk at the grocery store, or the mental list of things we need to do today. I remember one time recently when a friend was talking to me, and I was listening, and talking back, but I was also doing something else – sorting books, if I remember correctly. All of a sudden it hit me – my DUH! moment – my friend was more important than the books I was sorting, the books would still be there, and my friend deserved my full attention, not just a part of my attention. So I stopped what I was doing, and turned my full attention to my friend. The conversation changed at that very moment, from one of communicating some information, to a true conversation and receiving the gift of my friend’s presence. All because I made a choice in the moment to put aside everything else, and create space that was only for my friend. If I am thinking about other things, I am not truly present to the other who is with me – God or my friends. What does it mean to be hospitable toward ourselves? That also has to be intentional. Where do we need to be, what kind of space do we need to be in, in order to be fully present to God? I encourage people to find a place or make a place in their home or elsewhere that can be that place for them, someplace where they can more easily shut out distractions. Did you know that attempting to shut out distractions actually drains energy and takes energy away from the encounter you are having with another? So if you’re trying to block out noise, or other distractions, you are less present with God. I ha ve a space in my home that works for me – a comfortable couch in a room where I can shut the dog out, shut out other noises in the house, and devote that time to just me and God. Maybe you don’t have a place in your house where you can easily do that – I know some people who actually use the bathroom! They know they won’t be disturbed there. J Maybe it’s a nearby park, or you may drive and park somewhere if you need to. 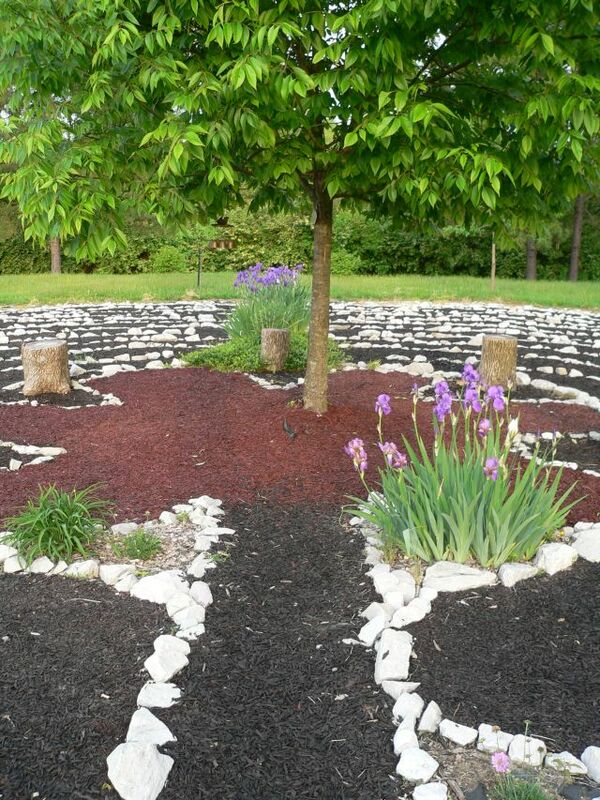 I’m also fortunate enough to live within walking distance of a park where there is a beautiful labyrinth, and the act of walking the labyrinth very slowly helps me center myself, put aside my daily todo list, and open myself up fully to God. However you need to do it, taking both the time, and creating the space, where you can be fully present to God is essential for a growing spiritual life. Is it easy? I’ll be honest – it’s not easy, if you are not used to doing it. If we are not used to shutting distractions out in order to be fully present with God, even for just 5 minutes, those other things (thoughts and people) that are used to having 24/7 access to us won’t just disappear. They will still clamor for your attention – your todo list will still invade your thoughts, your children will still bang on the door, your dog may still whine. But as you practice hospitality toward God and toward yourself, you will learn to let your stray thoughts and your children and all those other things clamoring for your attention know that you have not forgotten them, but for this brief time, you are reserving yourself for a sacred moment with God. It takes intentionality. It takes being intentional about setting aside time, no matter how many things are clamoring for your attention. It takes being intentional about putting yourself in a space where you are comfortable and will not be disturbed. It takes being intentional about wanting to connect more fully and deeply with the divine in your life and in the world. The gift that will come will be immeasurable. It really does. We can come up with all the excuses in the world, but the simple fact is, if we want a deeper relationship with *anyone* we have to be intentional about cultivating it.